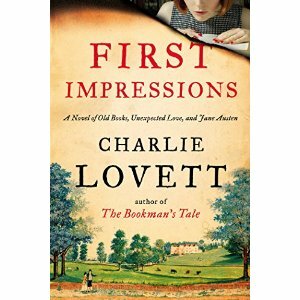 First Impressions by Charlie Lovett is a great book for those who enjoy mysteries in addition to Jane Austen novels. It has been decades since I read Austen in high school and this novel prompted me to reminisce not only those days, but also Austen’s exceptional literary works written so long ago. The premise behind this novel is Jane Austen may have plagiarized Pride and Prejudice. Drifting back and forth, the story tells of an enduring friendship between Jane Austen and an elderly clergyman, and in current time, a young bibliophile named Sophie who is trying to determine if her beloved uncle fell to his death by accident or via a well-placed push. Much like Lovett’s previous book, The Bookman’s Tale, I enjoyed the pace and creativity of this story. It held my interest and I recommend it to my followers. This entry was posted in Uncategorized and tagged bibliophile, Books, Charlie Lovett, England, First Impressions, Jane Austen, mysteries, Mystery, The Bookman's Tale. Bookmark the permalink.